SolutionsPal specializes in eCommerce and shopping cart development, providing professional web based business solutions for your company. Our platform allows your business to grow beyond its geographical location and maximize growth by using a shopping cart. The results potential is far reaching. For example, if your business is located in Michigan, our platform opens your business up for the entire world to shop your store. Our shopping cart solution is the quickest wat t obreak down the barrier between local and global reach. Our team is ready to help you find a custom solution for your online store. We can even host your store for you and keep it up to date. 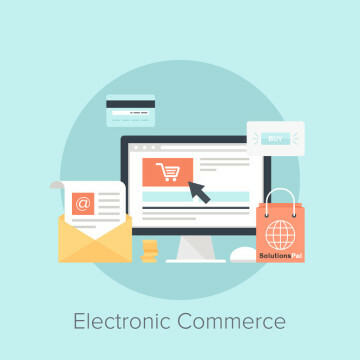 Our eCommerce websites and shopping cart solutions are built to perform and provide the necessary resources to position you for success. Whether you’re starting a new eCommerce website or looking for an ecommerce re-design, our goal is to provide the best professional eCommerce web design solution for you at an affordable price. We can design unique features that make online transactions easy for you and your customers. These features include inventory management, coupons, unlimited product categories, and much much more. By maximizing your eCommerce solutions, you can also sell subscriptions or charge for other website services offered by your site, ads well as take direct payments online. Simple, convenient, intuitive… our eCommerce solutions work. There are no limits to what your e-commerce site can achieve.